There are two kitchen helps I find so very useful during the Daniel Fast. Rice Cooker – mine is small and makes a maximum of 6 cups of cooked rice, but that’s an okay amount for what I need to prepare. For every cup of dry rice, I add 2 cups of water. Toss in some sea salt, pop on the lid, and flip the switch. It turns off automatically when the rice is cooked and it takes about 40 minutes. It’s so easy! Salad Spinner – okay, here is my true confession: I hate making salads. I know I am not supposed to confess negative things over me (maybe I will try and declare that I love making salads during the fast 🙂 ) but for some reasons, making salads is not a thrilling experience for me. That’s why I like using the salad spinner. Easy to just wash, tear, spin and the lettuce is ready. Just another word on salad making strategies. When I return home from grocery shopping, I cut up all the fresh ingredients for salads and store them in air-tight containers in the fridge. Then when it’s time to make a salad, I just add the amount of each ingredient I want to the bowl and it takes about 3 minutes to put together the medley. The good news is that for someone who has an aversion to making salads, this almost makes it a non-issue! Pray for me! Yes, coconut milk is fine if the ingredients comply with the Daniel Fast Guidelines (available at http://www.Daniel-Fast.com). I too like to add dates or raisins to hot cereal – and then I use unsweetened soy milk. My fast is going well now that I’m working on week 2. I found that dates make a wonderful sweetener for whole grain cereal in the morning, also wondered if coconut milk would be ok to use in this fast? Yes! 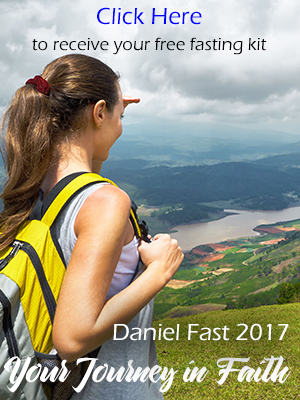 The new book has all the recipes you will need for a successful Daniel Fast. Go to http://www.Daniel-Fast.com/store.html and click on Barnes & Noble. They still have copies. HI susan….I have my mother and father who are doing the daniel fast and we are a family of four with many things to do at night…is there any recipies that are quick and easy…????? Yes, matzo is okay on the Daniel Fast. However, I suggest you get the whole wheat variety. The Lord’s Supper always takes precedence over fasting. It serves as the body and blood of Christ. Thanks for the questions and God bless you on your fast. Also, what are your thoughts about taking communion of yeast bread and grape juice? One dressing I especially enjoy is grapefruit and olive oil. I just take 3/4 cup extra virgin olive oil and 1/4 cup fresh grapefruit juice and whisk them together with sea salt and freshly ground pepper. I love this dressing served over a salad of Bibb lettuce, grapefruit sections and red bell peppers. Blessings to you on your fast! I thought I read a coment a few days ago where you described making a salad dressing using grapefruit juice. Would you please repeat it again? Thank you for all this wonderful information and work you have done. I have just recently learned about the Daniel Fast and am thinking of starting it the first of March. My husband and I are taking a class in another community so must eat out on those nights – what do you eat when you go to a restaurant? I am not familiar with that specific product, but if it is sugar-free and chemical-free it should be fine. I eat applesauce on the fast and I especially like it with wholegrain cereal as a way to add a little sweetness. Yes, all healty oils are acceptable on the Daniel Fast. Actually, it’s not about “natural” but rather that honey is a sweetener. So that would make it not acceptable, just like agave nectar, maple syrup, raw sugar and cane juice are not allowed. and has no preservatives, is it allowed. Lemons, along with all fruits, are allowed on the Daniel Fast whether fresh, frozen, dried, juiced or frozen. I was wondering, I thought that we weren’t allowed to have oils? But, I purchased the cookbook, it looks WONDERFUL, but has lots of times using oils? Also, it used tomato soup, dijon mustard (wouldn’t these items have preservatives in them). Just curious. This is my second year fasting with Free Chapel in GA, and I didn’t know about any of these things being available? I’m wondering if there is a recipe for a salad dressing that I can make other than oil & vinegar. Suggestions appreciated.